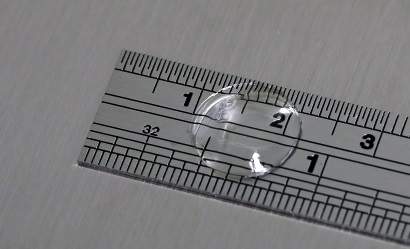 Because our croslinked hydrogels are shape-retaining, we microfabricate surface topography structured or surface micro-patterned hydrogel disks or sheets for cell guidance. These may include microchannels or microprinted lines of bioactive materials. 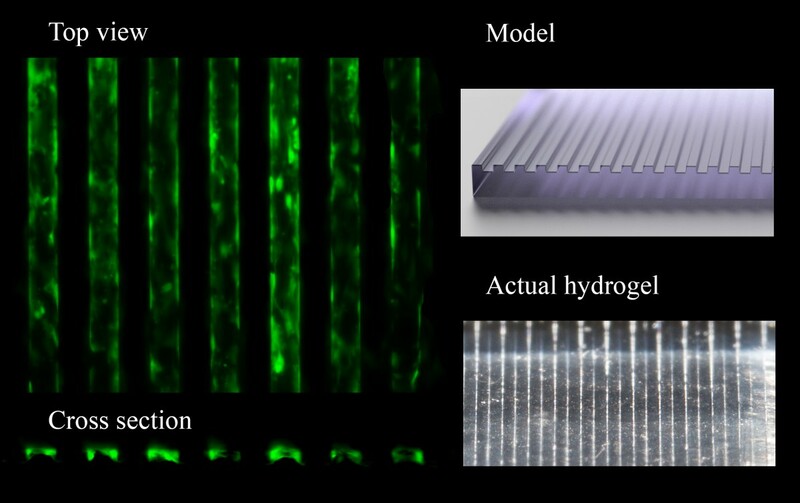 We can custom design a hydrogel with specific micropatterned/micromoulded patterns. As these are custom projects, the pricing will be determined based on time and materials needed to implement a design. Please contact us at info@ferentis.eu to discuss your requirements and application. 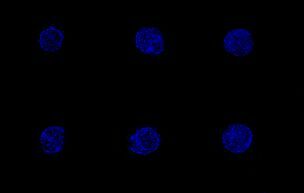 Multiwell plate hydrogel insert, 96 wp, with microwells 6 mmØ x 500µm Microwells for spheroid culture, 400x400x200 µm, array of 166 wells. Ready to use hydrogel disks/sheets in vial, in PBS solution. 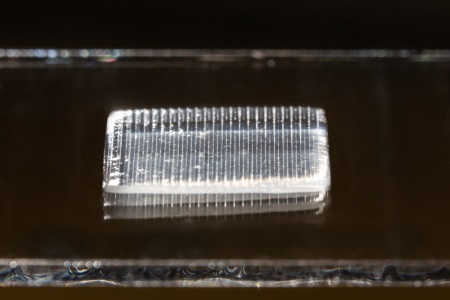 Micromoulded hydrogel sheet with microchannels for cell guidance 1,5 x 1,5 mm Microchannel lines, width, µm: 30, 50, 60, 200, 500; depth, µm: 20. 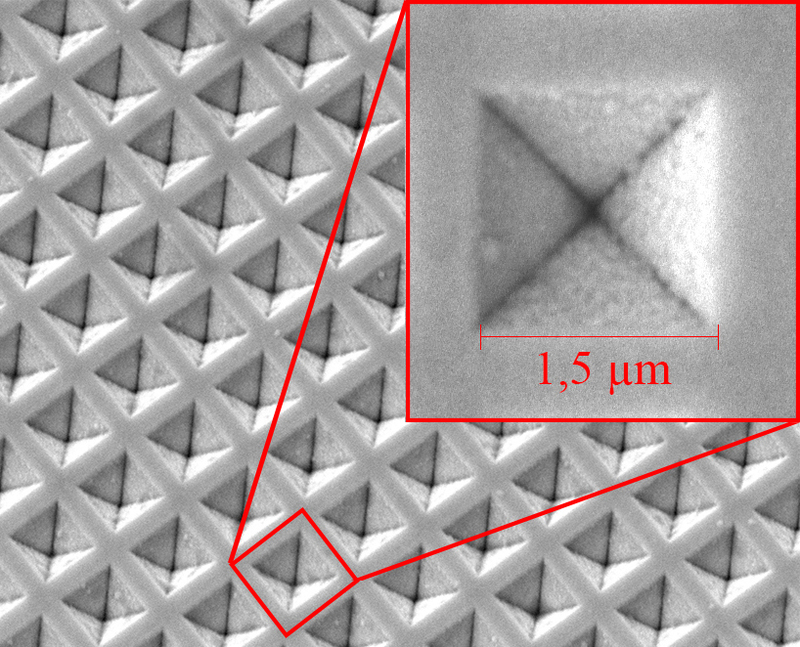 Nanostructured multiwell plate hydrogel insert, 96 wp 6 mmØ x 500µm Microwell topography for cell adhesion, square width, µm: 1,5 x 1,5; depth, µm: 0,5; array area, mm: 5 x 5. As these are new materials, prices shown are indicative and introductory, and are subject to change subject to changing costs, market conditions, modifications requested, quantities ordered, etc..
Prices do not include shipping. All international orders will be shipped by courrier mail (DHL, UPS, TNT, Fedex, etc. ); shipping costs will be confirmed during ordering. If you prefer using your own shipping company account, please note this when placing an order.